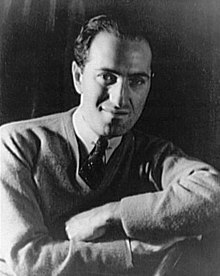 George Gershwin (September 26, 1898; Brooklyn, New York – July 11, 1937; Hollywood, California) was an American composer. George Gershwin was born on September 26, 1898, in Brooklyn, New York. His family immigrated to the United States. Gershwin, his two brothers and sister had a close, happy family life. George liked playing games on the streets of New York. He liked exploring the city, but he did not like school or studying. While exploring the city, Gershwin heard jazz and blues music spilling out of public drinking places. However, he did not become seriously interested in music until he heard another boy playing the violin in a concert at his school. Gershwin began to take piano lessons. His teacher was a fine classical musician. He immediately recognized Gershwin's unusual ability. The teacher wrote about him to a friend: "I have a student who will make his mark in music, if anybody will. The boy is a genius, without doubt." Gershwin studied classical piano, and he was a first-rate pianist,but his strongest interest continued to be jazz and popular music. He loved playing piano and it was his passion.At the age of fifteen, he left school and went to work in the music business. The New York City street where most music publishers had their offices was called "Tin Pan Alley." The phonograph and radio had been invented in the late 1800s. But it would be many years before there were musical recordings or regular radio broadcasts. Tin Pan Alley publishers needed another way to sell new songs, so they employed people to play the piano to do this. The piano players played the songs all day long to interested singers and other performers. Gershwin was one of the youngest piano players in Tin Pan Alley. Soon, he was considered one of the finest there. He was already writing his own songs. He succeeded in getting one published when he was only 18 years old. It had a long title: "When You Want 'Em, You Can't Get ‘Em, When You've Got 'Em, You Don't Want 'Em. " Gershwin was now a real composer. The rest of his life was an unbroken record of success. He wrote song after song. His ideas were so endless that he was not even troubled when he once lost some music he had been writing. "There is plenty more where that came from," he said. Gershwin had his first big hit in 1919, when he was twenty-one years old. It was a song called "Swanee." A popular entertainer, Al Jolson, sang the song. "Swanee" was made into one of the first musical recordings. Gershwin was suddenly famous. He also was in the Grammy Hall of Fame. Music critics note that "Swanee" is not like most of Gershwin's music. Later, he wrote true love songs. Some were light and funny. Some were full of intense feeling. Many of these songs were written for the popular musical theater. One of his most emotional love songs never became part of a musical play, however. It is called "The Man I love." The song was sung by the Francine Evans role [played by Liza Minnelli in Martin Scorsese's film, New York, New York]and supposedly 'written' by her character for her soon to be husband, Jimmy Doyle [superbly played by Robert De Niro], of the Jimmy Doyle Orchestra.His character also 'wrote'the title song, New York, New York, who was actually written by Fred Ebb, music by Kanter, his partner. The song became New York's official anthem in 1985. Gershwin's older brother, Ira, wrote the words to "The Man I Love". As George became famous, Ira wrote the words to more and more of his songs. The two brothers were very different. Ira, the writer, was quiet and serious. George, the musician, was outgoing—the life of any party. When they had to finish a new musical Ira locked George in a hotel room until it was done. But George wrote better songs with Ira than with anyone else. One of many examples of the Gershwin's combined work is the song "They Can't Take That Away From Me." The Gershwins wrote the song for dancer and actor Fred Astaire for the film "Shall We Dance." That was George and Ira Gershwin's first movie musical. Many of George Gershwin's songs were first written for musical plays performed in theaters in New York City. These comedies, with plenty of songs, were a popular form of entertainment in the 1920s and 1930s. One of Gershwin's musical plays, "Girl Crazy," introduced a young singer named Ethel Merman. She became one of the most celebrated performers in America. In the play, Merman sang a song George Gershwin wrote just for her. It was called "I Got Rhythm". Many songs that George Gershwin wrote for musical plays and movies have remained as popular as ever. Over the years, they have been sung and played in every possible way—from jazz to country. One example is the song, "Someone to Watch Over Me." It was written for the 1926 musical "Oh, Kay!" In the nineteen twenties, there was a debate in the United States about jazz music. Could jazz, some people asked, be considered serious music? In 1924, jazz musician and orchestra leader Paul Whiteman decided to organize a special concert to show that jazz was serious music. Gershwin agreed to compose something for the concert before he realized how little time he had to do it. The concert was just a few weeks away. Gershwin got busy, and, in that short time, he composed a piece for piano and orchestra. He called it "Rhapsody in Blue." Gershwin himself played the piano part of "Rhapsody in Blue" at the concert. The audience included some of the greatest classical musicians of the time. When they heard his music, they were electrified. It seemed to capture, for the first time, the true voice of modern American culture. Today, we can still hear Gershwin playing "Rhapsody in Blue." An old mechanical piano recording Gershwin created has been reproduced exactly. There are also very early versions of "Rhapsody in Blue" which feature Gershwin playing the piano with Whiteman's orchestra. Those recordings, because they are early, do not sound like modern recordings. But they are recordings of Gershwin at the piano. This makes those recordings important. "Rhapsody in Blue" made George Gershwin famous all over the world. Several hundred thousand copies of the printed music sold immediately. Gershwin was satisfied that he had shown that jazz music could be both serious and popular. Gershwin also wrote an opera, "Porgy and Bess. " It was based on a book by DuBose Heyward. It is a tragic love story about black Americans along the coast of South Carolina. "Porgy And Bess" opened in Boston, Massachusetts in 1935. Audiences loved it. But most critics did not know what to think of it. It was not like any other opera or musical play they had ever seen. Gershwin did not care about the critics' opinions. He believed some of his greatest music had gone into the opera. He said he had created a new musical form—an opera based on popular culture. Today "Porgy And Bess" is considered a masterpiece. Another well-known Gershwin piece is "An American in Paris. " It is a long tone poem for orchestra. Its first public performance was by the New York Philharmonic Orchestra in 1928. Once again, opinion was mixed. Most people loved "An American in Paris," as they loved all of Gershwin's music. Some critics liked it, too. They called it happy and full of life. Others hated it. They called it silly and long-winded. George Gershwin died in 1937, just days after doctors learned he had brain cancer. He died while having surgery to remove the brain tumor. He was only thirty-eight years old. Newspapers all over the world reported his death on their front pages. Everyone mourned the loss of the man and all the music he might have written. Gershwin is still considered one of America's greatest composers. His works still are performed by many singers and groups. They are probably performed more often than any other serious American composer. Austrian composer Arnold Schoenberg was one of the people who praised George Gershwin. Schoenberg said Gershwin was a man who lived in music and expressed everything through music, because music was his native language. This page was last changed on 13 September 2018, at 20:11.